Exclusively designed and manufactured by our supplier, these light pendants are easy to fix either in a new project or to replacement of an existing fitting. The Bakelite version is closely modelled on a 1920's original. 2 styles of light pendant are shown; Bakelite or hardwood. The top photo shows the mix 'n' match you can do with these pendant light fittings. The Bakelite domes come in either brown or white finish. The hardwood pendants & bakelite backing pattress boxes come in 5 hardwood finishes, shown below; natural/light/medium & dark Oak & Mahogany. The Bakelite version also offers a white finish backing pattress. The Bakelite lamp holders come in either brown, white or brass finish, as shown in the top main photograph. There are 3 silky flex cable colours avaliable, shown below; brown, white or gold. Please specify if the flex cable needs to be 2 core or 3 core when ordering. The flex cables are 20cm long. The pendant light fittings come fully assembled. We can supply additional flex cable, at a per metre charge. Bakelite pendant - Ref BP. £TBC + VAT & delivery. Hardwood pendant - Ref HP. £TBC + VAT & delivery. We will quote you a price when we know what you require, quantities & postage. Please contact us to discuss this further. Pull cord switches are generally only used in the bathroom, the original idea being to stop wet hands touching electrical fittings. The Bakelite domes are available in white or brown. 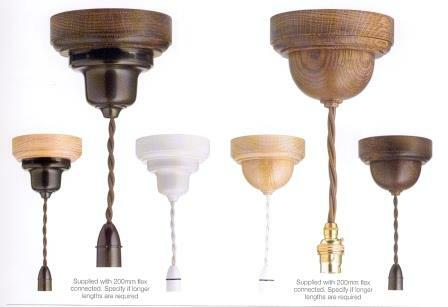 The hardwood pull switch is available in the 5 finishes below. The Bakelite dome backplate comes in a choice of 5 wood finishes (see below) & white - specify finishes required. The Bakelite pull is white china, with a thin black band & chrome fittings top & bottom. The hardwood pull is avaliable in 2 shapes & the 5 finishes, to match the switch. Inc.s 1.5M of pull cord. Specify if black or white pull cord. Hardwood pull switch - Ref HS. 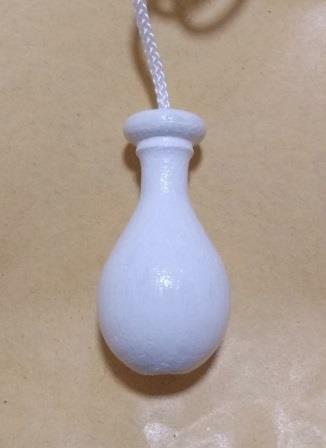 You can order the white china hand pull seperately. 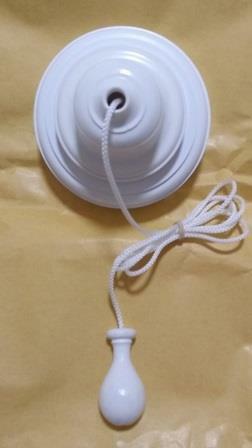 This is a larger version of white porcelain switch pull, available for use as cistern pull. Height 136mm. Ref CP. While a pull switch is authentic for a Deco style bathroom, they can be a bit fussy visually, especially today as we're more used to cleaner lines in our interiors. A much neater way of switching lighting is with a concealed sensor switch. These can be fixed either behind a tile or to the reverse of a nice Deco faceplate. Ask for more details. Please Note all light switches are 2-way as standard. Intermediate (INT) or double pole (DP) switches are available upon request ( an additional charge will be incurred for these). Please Note; Oak products - All our Oak products are carefully selected, hand finished and stained. However we cannot guarantee that colour matches will be consistent between previous orders and singular orders where more than one item has been ordered. Any slight colour variation is due to the fact that the Oak is a natural product with varying degrees of grain structure. Any existing product that you are matching with new product may have aged and darkened with time. The light pendant fittings come fully assembled, with a choice of 3 colours of flex cable, brown, white or Gold. You must specify whether you require 2 core or 3 core flex cable - if unsure speak to an electrician. We can supply additional flex cable, at a per metre charge.